The Vitamin Z Store is the place to buy official Vitamin Z merchandise and gear. By purchasing one of our products you are helping us to continue working on Vitamin Z and other products. We hope you will be a part of our journey. Thank you. —————————–Douglas Farra, President—The House of D.O.N., Inc. The complete first season of Vitamin Z on DVD. The first season DVD comes with all eight of the original episodes. Plus you will get DVD bonus features, such as, “The Lost Episode” – Original Episode 1, A behind the scenes look of filming at Las Vegas Mannequins, and the promotional videos “Breaking News” and “Vitamin Z Commercial”. The official sticker of Vitamin Z. This visible sticker is perfect for a back windshield, bumper or anywhere else you want to put it. The official sticker from Season 1 Vitamin Z. Let everyone know you support the next great Zombie Series and get the Vitamin Z sticker today. We recommend sticking it on anything and everything. 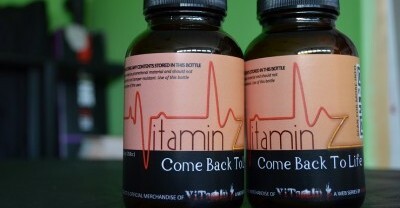 This Vitamin Z Vitamin Bottle is official merchandise that helps represent the back story of the show. The label displays the logo that was created for the Vitamin Z product that was launched containing the virus that caused the zombie apocalypse. To read more about the story…Vitamin Z. You can use this bottle for anything you like. You can put your own vitaminz in it, store herbs or other small perishables in it. You can even give it to your friends as a gift. The jar is made of glass, so it is fragile. Dimensions: 2.6″ width x 4.7″ height.